Sculptures of Saints Justus and Pastor. Belltower of the church of Sant Just, Barcelona. The western façade of the Cathedral of the Santos Niños, illustrating a "florid" or "Isabelline Gothic" style. Saints Justus and Pastor (Latin: Iustus et Pastor; died c. 304) are venerated as Christian martyrs. According to their Acts, they were two schoolboys (Justus was 13 years old, Pastor less than 9) who were killed for their faith during the persecution of Christians by the Roman Emperor Diocletian. Flogged and beheaded outside the Spanish city of Alcalá de Henares (known in Roman times as Complutum), they are today considered the patron saints of Alcalá. They are mentioned by Prudentius. Relics believed to be those of Justus and Pastor were discovered in the 8th century and taken to Huesca. In 1568, they were brought back to Alcalá de Henares and interred beneath the high altar of the city's Cathedral-Magistral of Saints Justus and Pastor (known familiarly as the Catedral de los Santos Niños). Constructed between 1497 and 1514,the ancient cathedral is still in daily use, and the saints' tomb is accessible to the public. The Basilica of Saints Justus and Pastor in Barcelona was erected in the 16th century in the Gothic style. 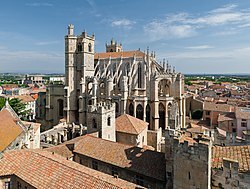 Narbonne Cathedral located in the town of Narbonne in southern France is also dedicated to Justus and Pastor. The story of Justus and Pastor is mentioned in the 2001 film The Others by Spanish director Alejandro Amenábar. Wikimedia Commons has media related to Saints Justus and Pastor.